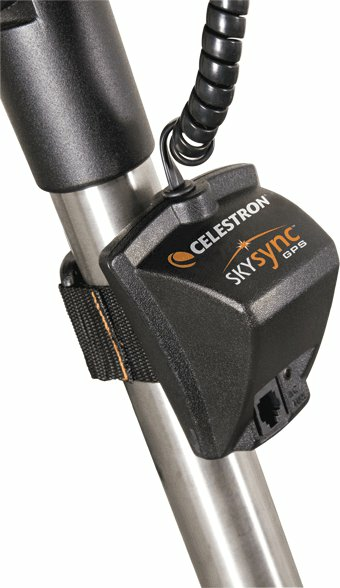 The Celestron SkySync GPS module is a 16-channel GPS module which is suitable for all non-GPS Celestron computerized telescopes. 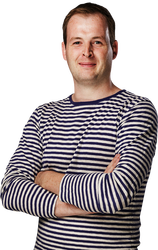 The GPS module is plugged into the hand controller (or in the aux port) after which the exact time, date as well as degree of latitude and longitude of many satellites are downloaded automatically. The module comes with two mounting straps. Alignment is even easier now! Small, neat and works well. It's far too expensive for what it is, but it makes setup very straightforward (I'm using it on a Nexstar 5SE). Tip for the Nexstar telescopes: Strap the GPS to the fork arm instead of the tripod leg. That way the cable won't get tangled as the mount moves. It's easy not to notice in the dark! This is a high quality item and makes setting up the telescope and mount much quicker and more accurate. As a beginner astronomer I wanted an easy to use configuration, this is why I added this piece of equipment to the telescope. All I have to do is to plug it in to the go to system, tell once the go to system to enable Gps, and it does the rest. Very convenient indeed. No need to enter time and location, the telescope is very accurate at finding and tracking objects, and through the View Time-Site menu I have my exact latitude to set the mount correctly. An excellent if rather expensive addition to the kit bag but very useful and easy to use. Simply turn on GPS on the handset plug the handset into the GPS unit and the unit into the scope turn it on and away you go all settings including time are entered saving the hassle of doing it yourself. The fastening strap is a little awkward to fit but does its job once in place. Will be very welcome on those cold nights when the fingers are frozen and you don't really want to have to take your gloves off. All settings are loaded automatically. Fitting strap awkward to use. I purchased this recently and am very pleased. It goes whithout saying it is much too much money but it DOES do the job well. I am certain my GO-TO is now more accurate with means i am using my scope more with more enjoyment.It is a peice of cake to set up and a great addition,shame about the price !